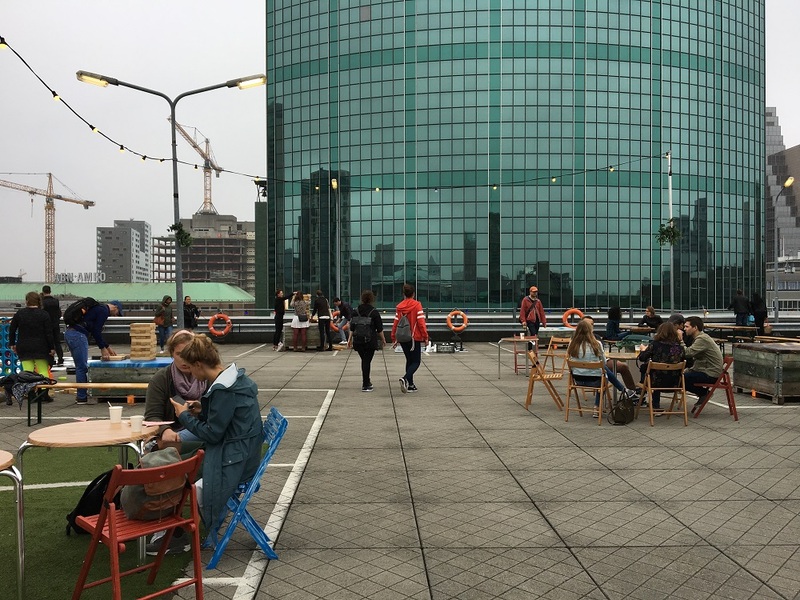 On the first weekend of June, Rotterdam opens its rooftops in the yearly Dakendagen event. 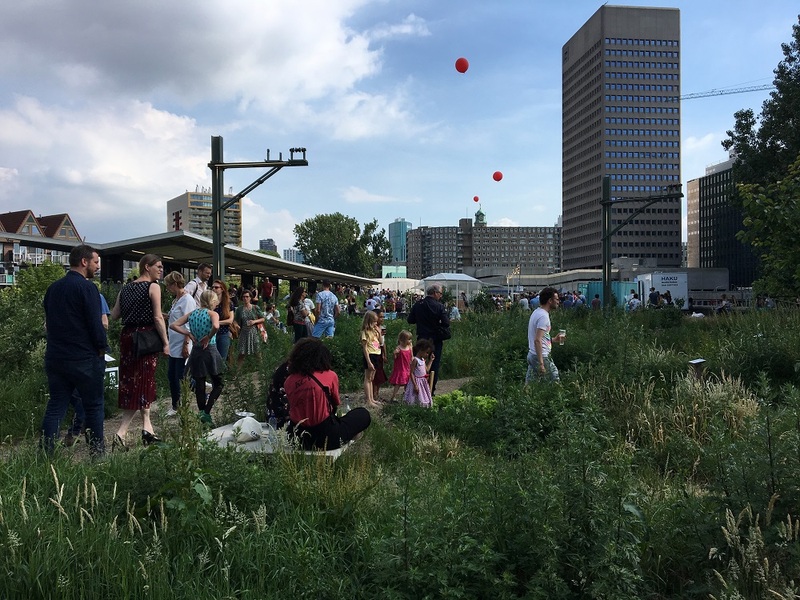 Touted as an opportunity to explore new possibilities of public space and encourage novel ways of experiencing the city, we ask, is the event up to the task? 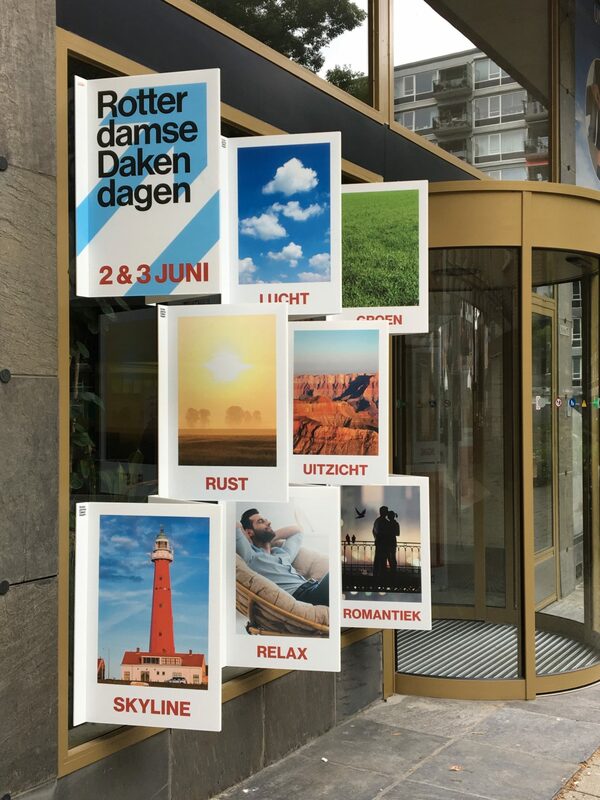 The Dakendagen website ambitiously declares that the event ‘wants to stimulate the use of roofs. We want to show how roofs can bring about a healthy, living, accessible and future proof city. 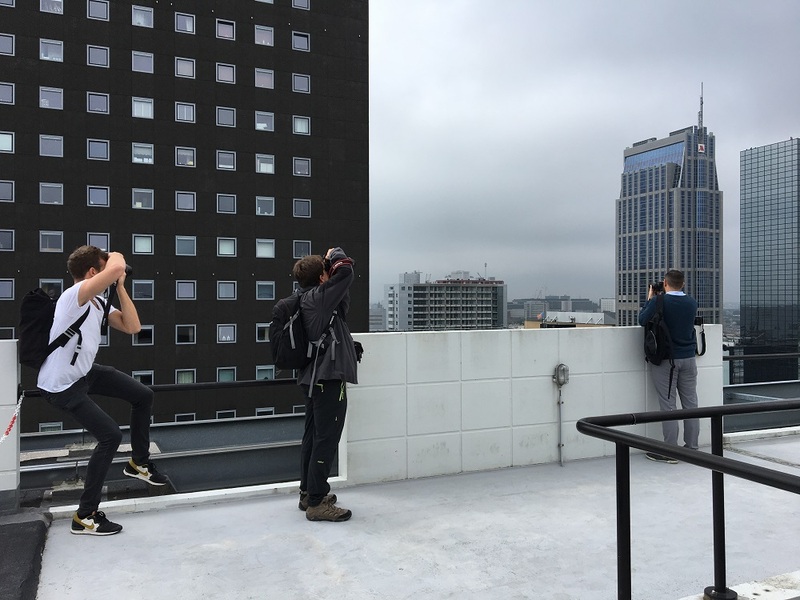 We see the centre of Rotterdam as an open laboratory and show inspiring examples of rooftop use.’ The yearly event, an initiative of the Rotterdam Architecture Month and Rotterdam Festivals, has been showcasing rooftops in the city since 2015. Surely a worthy endeavour, because rooftops, generally the domain of mechanical installations, signage and rich people, have re-emerged as a hitherto unexplored urban layer, made possible by technological and demographic shifts. They can be activated as gardens or solar panel farms, they can provide public spaces, and they can offer new ways of getting from one place to another –who knows, perhaps the advent of drone flight could see them become principal addresses. In any case, the spread of satellite-based tools like Google Earth has made rooftops part of our urban imaginary like never before –veritable fifth facades that express the city just as much as what one sees on the ground. Before attending the event, I wondered how I could learn more about the organization and its elevated aspirations? Figuring the best bet would be to contact the PR representative, I sent an email to the address mentioned on the website. One week later, no response. So I ventured over in person to their offices, located conveniently next to mine in the Agniesebuurt of Rotterdam. I buzzed on the intercom, a brand-new device with a touchscreen display that took some seconds to master. A faint voice answered. “Hallo,” I intoned cheerfully in an almost Dutch accent. (I figured this would open all doors for me.) “I am writing an article about the Dakendagen and I thought maybe I could pass by and get some kind of general information from you and maybe ask a few questions?” There was the muffled sound of a voice in reply, not quite audible above the sound of the delivery man pushing a shaky cart through the lobby. Then the intercom went suddenly silent. It had a cut-off timer. And the voice, although incomprehensible, sounded friendly, so I dialled again. Numerous muffled half-minute intercom salvos with the soft, friendly voice later (more or less the time it could have taken to go upstairs and grab a pamphlet), we had somehow successfully established that I would be contacted later by the organization. I left my number and e-mail. God knows if anything I said was audible, but I was never contacted. I thus embarked upon the Dakendagen with my mind a blank page, having no initiation or previous information – perhaps better for the sake of total journalistic objectivity? 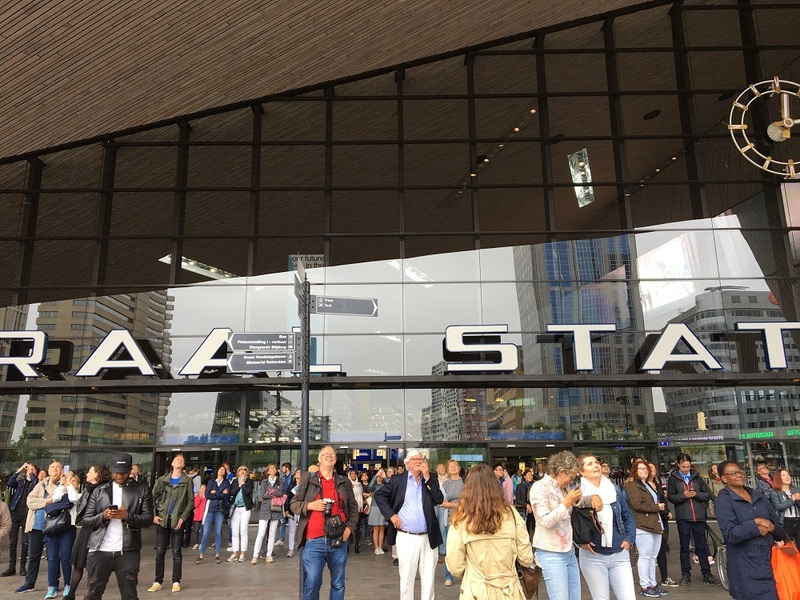 Saturday kicked off with a tightrope act by the Dreamwalkers between the Marriott Hotel and First building, just in front of the Centraal Station parvis – a bit of adrenaline to jumpstart the weekend, presumably getting us in the mental zone for being up at the tops of buildings. Clumps of people showed up, and the Stationplein became fairly crowded. As I stood there looking at the thin black cable spanning between the two buildings, I started to wonder how it would all begin – would there be a loud introductory flash somewhere, or some video on the screen, or perhaps an announcement from speakers declaring the Dakendagen officially open? Would someone in a gaudy tuxedo suddenly appear on a nearby building, jocularly putting us all in the mood for some rooftops? Whilst eagerly peering around for some sign of the kick-off, I heard a faint ‘ohhh’ from the crowd as a little figure emerged from a window and slid onto the rope. And with that silent step into the void, the Dakendagen began. I soon learned that the rooftops tend to attract lots of amateur photographers. The soundtrack of SLRs merrily clicking away like so many synthetic crickets accompanied my entire sojourn atop the Central Post building. (I wonder if sound artist Ariane Trümper’s microphones captured this auditory feast for her sonic installation). The camera fanatics, mainly lone wolfs but sometimes in packs, straddled and stretched themselves all over the parapets, surely thrilled by the possibilities of the roof. Modernist rooftop at the Lijnbaanflat, closed. Through the glass revolving door, the attendant mouthed something about not having the key to get in. On the roof of the Haka Gebouw, I approached the attendant girl to ask her if any event would be taking place. She shook her head, and I asked if maybe something related to the Biennale (located in the Haka Gebouw itself) might be happening, and she again indicated no. Could she recommend any other rooftops for me to check out, or were there any other special events that day? She responded, sheepishly, that she didn’t know. I said goodbye and awkwardly backed up, retreating from the rooftop of the Haka Gebouw. Similar non sequiturs at the DakAkker and Kunsthal (access to the current exhibitions was a plus, however). Why didn’t they put some kind of installation on these roofs, I wondered? Even panels with images and text to describe the building or the neighbourhood, or some poetic fragments about what makes roofs interesting, would be welcome. What about binoculars perhaps, or some kind of device to communicate with the other rooftops, like a network in the air? They had opened the doors to the roof, but so what? So far, this feels like a box-ticking exercise. 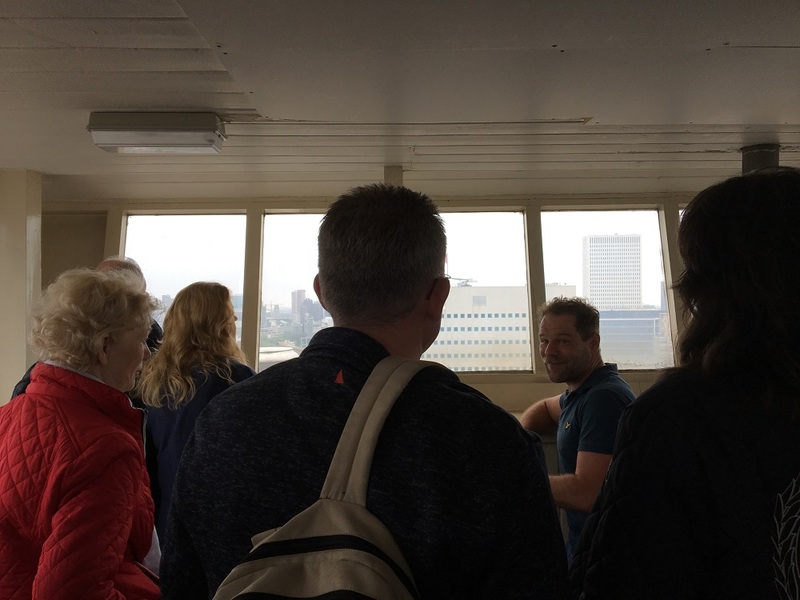 The GEB Toren roof module, designed like a ship’s bridge, was a welcome respite in my solipsistic ambling, filled as it was with the animated voice of raconteur Ferrie Weeda leaping through stories about the history of the building and the neighbourhood. It was rather welcoming to hear a human voice accompanying the visit, making the rooftop experience palpable, finally. It was also a welcome alternative to the ubiquitous polite ‘leuks’ of bemused middle-aged citizens, which were almost as frequent as the SLR clicks. I decided to wrap up the day at the Dakendagen HQ, located on the parking deck over Hudson’s Bay, where my Dakendagen map informed me that the ‘Feest in het Festivalhart’ was taking place with Cape Verdean Sodade ‘op het dak’. Secretly expecting a carnival, I was met by the sounds of a handful of people participating in some sort of drum workshop (imagine noises more or less like rainfall, but amplified). Here and there blown-up jenga-type towers stood, with small groups of people giving it a shot (‘leuk!’). Around the tables, some sat trying the drinks. Standing by the parking lot was an inflatable fun fair slide, looking solitary and destitute under the grey sky. Sodade, indeed. Well, I thought, let’s give it another try tomorrow. Day two of the Dakendagen. This time the weather was on our side. So I swung by the Festivalhart once more to see if things had cheered up. Instead of the drum-drops, there was now a DJ putting on vaguely tropical music (my Dakendagen map calls it ‘Kizomba’) and couples shuffling around on the dance floor. I thought this must be what cruise ships are like, but without the giddiness of being on the open seas. Things took a welcome turn at the Luchtpark Hofbogen, at last. Lo and behold, the possibilities of the roof! As I wandered amongst the swathes of wild grass and little strawberry bushes, surrounded by visitors of all ages occupying clearings and perching on ventilation chimneys, it felt almost like a utopia, liberated from the everyday streets below (and from the banality of most of the other rooftops). Old electrical posts standing in the midst of the rough vegetation, lunar-looking hotel room pods, a marching band appearing from nowhere, a DJ playing decent music, funny sheep sculptures; unexpected elements juxtaposed, conveying a subtle sense of enchantment and, finally, fun. Needless to say, rooftop parks are nothing new. The success here is all in the careful mise-en-scène to create a surprising, yet nuanced experience; a culmination of years of development by ZUS architects. The Dakendagen website boasts of 20,000 attendees over 56 rooftops. (My map only lists 16, but ok). Why not open fewer roofs and make them more significant, relevant? The 2018 offering was almost purely anecdotal, sorely lacking curatorial panache on one side and critical mass of public on the other. 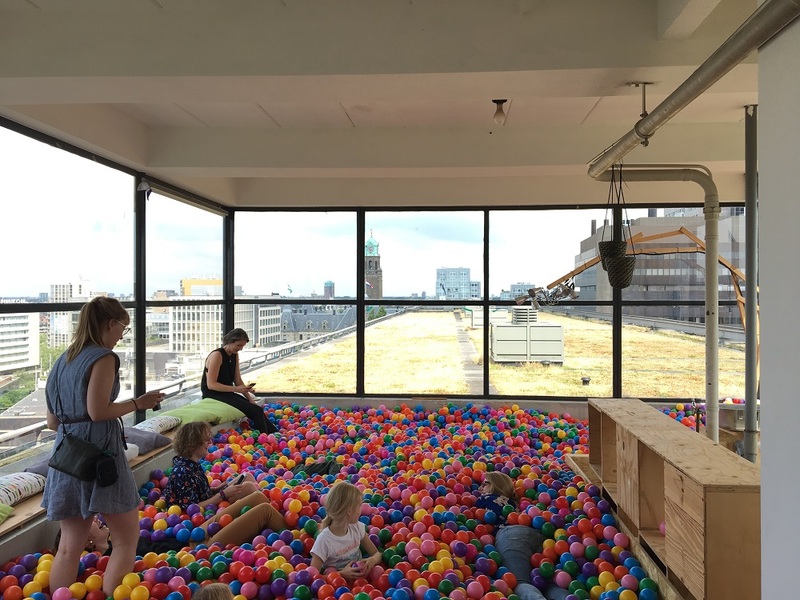 Future events would be wise to focus on a handful of well-programmed, memorable locations, perhaps aligned with a greater metropolitan place-making agenda, rather than mutely showing us what we already know – that a roof is on top of a building.